Online portals are helping college students find paid internships like never before. Mrinmoy Ghosh completed a BTech in electrical engineering from Konark Institute of Science and Technology, Bhubaneswar, in 2013. He has now enrolled for an MBA at Globsyn Business School, Kolkata. But before his classes commence from July, he plans to do internship to gain some valuable work experience. Ghosh considers himself lucky - he has managed to bag as many as four paid internships through a portal, Twenty19.com. This includes a digital marketing and sales assignment and an internship with a blog. "Since I've opted for an MBA in marketing and finance, an internship in the domain of digital marketing and sales will definitely spruce up my portfolio and I'll get practical experience," says Ghosh. "While working as an intern in a blog will add up as an extracurricular activity and I'll write better with practice." And, even as he interns, Ghosh takes home a cool Rs 17, 000 per month. Indeed, there are several other students like Ghosh who are seeking - and getting - internships through internet portals. These websites are positioning themselves as a one stop shop for students. Not only do they have companies offering internships, they also offer skill-based courses to make students more employable as interns. 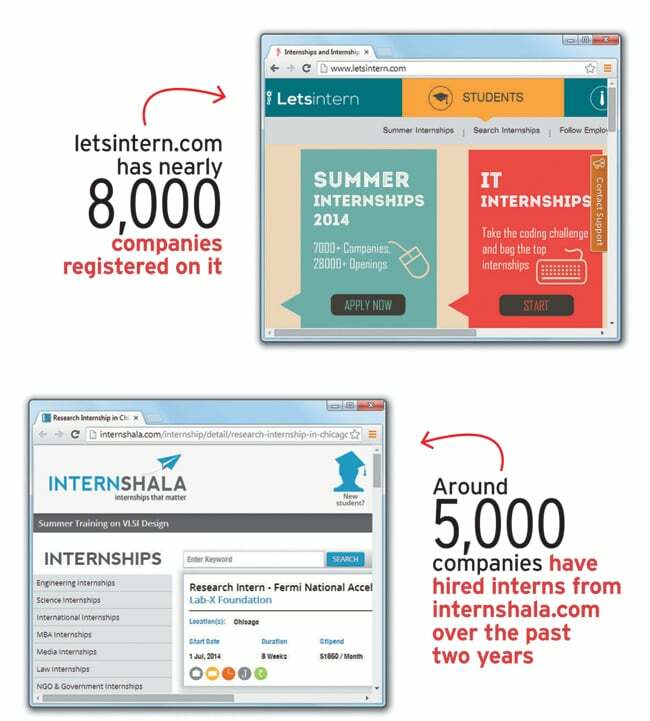 internshala.com, twenty19.com and letsintern.com are among the most popular portals. A bulk of the recruiters from these websites is small and medium enterprises (SMEs) and start-ups. For instance, 80 per cent of the companies who hired interns through Internshala in 2013/14 were start-ups, while 60 per cent of Letsintern's corporate user base comprises SMEs and start-ups. Harsh Beria, a third-year undergraduate student at IIT Kharagpur, says there is an array of internship assignments for students online - from software programming and content development to business management. "Nowadays, Internshala has also started publishing a number of international internships which is rare, and is not available on other internship portals," he says. 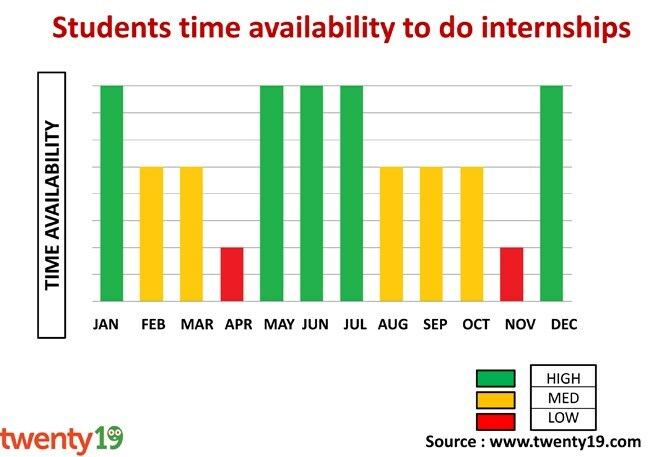 Internship portals have sprung up in the last three to four years and many of them already report healthy traffic in terms of visitors per month. They offer free mandatory registrations to students and companies but claim to have evolved viable business models. A registration allows students and companies to exchange messages online free. These portals make money through premium services and by offering paid skill-based courses that find favour with employers. Consider the example of Mumbai-based Letsintern. The website has 200,000-plus students and some 8,000 companies registered on it. It gets, on average, more than two lakh visits online every month. Letsintern offers its registered students a freemium model - they have free access to the website but certain features are limited for only premium or paying members. "Students pay anywhere between Rs 500 and Rs 1,500 for premium services such as putting their applications on top and sending CVs to companies of their interest," says Rishabh Gupta, Co-founder and CEO. "Similarly, corporates also have a free hiring model but have to pay up to Rs 15,000 if they wish to subscribe or use our premium services like large scale intern hiring and management. But we are still a long way short of where we want to be." Letsintern says it grew more than five times on key metrics in 2013/14, including the numbers of students getting placed and companies hiring interns through the website. It clocked revenues of close to $200,000 in the last fiscal. Interestingly, it also offers an Android app for interns. A free app, a student can create, search and apply through it. Letsintern has 15,000 mobile app users on android now. 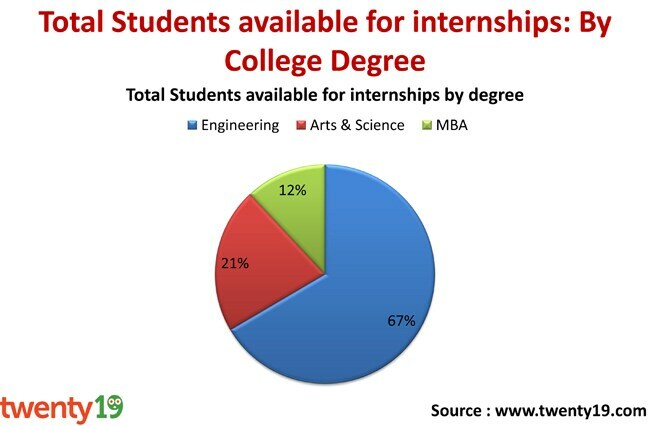 While its competitors - Internshala and Twenty19 - have diversified into offering skill-based courses, Letsintern remains focused on being a place for students to connect with companies and find relevant opportunities. Chennai-based Twenty19 has more than doubled its user base - both students and companies - in the last four years and expects to grow at a similar rate over the next five years. Karthikeyan Vijayakumar, Founder and CEO, says in this rapidly growing market, Twenty19 is operationally profitable, with no external funding. Creating a Twenty19 account is free for students and companies. Students are also offered skill-based offline courses by the portal, its main source of revenue. The pricing of the courses is nominal, ranging between Rs 249 and Rs 2,499. "Over 5,700 companies use Twenty19 to recruit student interns. On a monthly basis, over 300,000 to half a million students use Twenty19 for internships, courses and events," says Vijayakumar. "We have seen high demand from students for some of the digital age courses such as Android App Development and Online Marketing," he adds. Sarvesh Agrawal, Founder and CEO of Gurgaon-based Internshala says his internship portal has a sustainable and scalable revenue-generating model. It includes advertising on the website and on its Facebook page; paid online courses; and career services such as resume and cover letter writing besides grooming students for interviews. For instance, foreign universities that advertise on Internshala pay the website anywhere between $500 and $5,000, depending on the type and duration of campaign. And this year Agrawal's team is expecting some 3,000 to 5,000 enrolments for online training programmes that are priced between Rs 3,000 and Rs 5,000. At the end of the training, students are issued a certificate of training from Internshala. Among its most popular courses are web development and robotics. "Advertising runs throughout the year, training has a peak season during winter and summer when students have holidays and career services pick up steam closer to internship period and placement period," he adds. Around 5,000 companies have hired interns from Internshala over the past two years including Airbus, Philips and Genpact, among others. Political parties such as Aam Aadmi Party and the winning Bharatiya Janata Party too have picked up interns from the website. 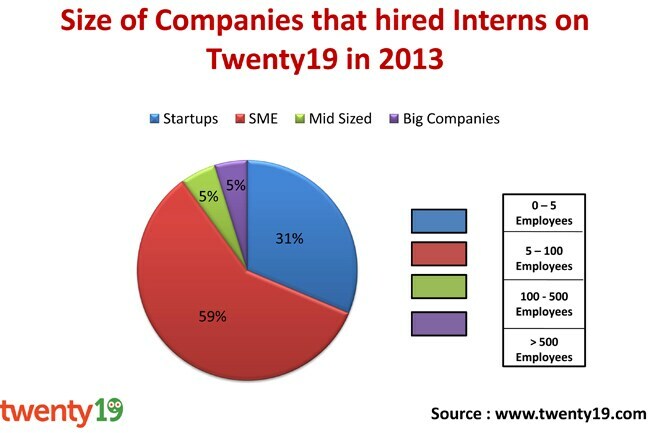 Similarly, Biocon, Flipkart, InMobi, are among the 5900 companies to have picked up interns from Twenty19. About 55 companies have recruited students in the last one year only from Letsintern, including Pepsi, HCL Technologies, Nielsen, Zomato and Flipkart. While salaries range from Rs 5,000 to Rs 25,000 a month for paid interns, Amazon hired an intern for Rs 30,000 during last summer from Internshala for a one-month assignment. Software, digital marketing, e-commerce, internet, media and marketing companies account for a bulk of the recruiters from these portals over the last few years . But it's not always easy to get an internship via online portals either as corporates screen each candidate through multiple tests. 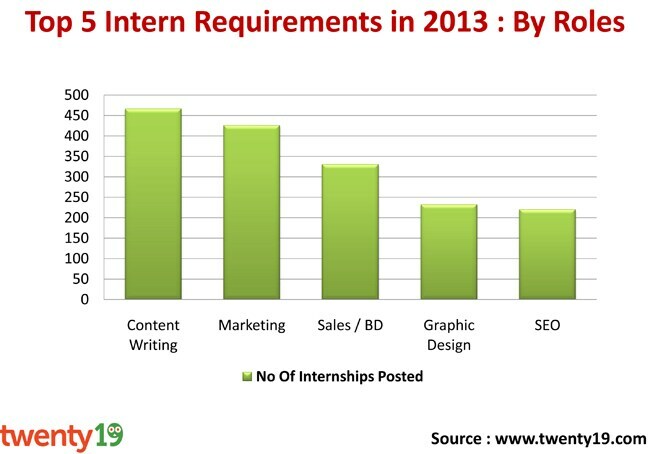 About 25 to 30 per cent of the students registered with Twenty19, 10 per cent with Internshala and 20 per cent with Letsintern have got internships. Sunil Goel, Managing Director of GlobalHunt, a leading executive search firm, says that though these web platforms are working as an effective bridge between the industry and students, most established companies are still reluctant to take too many interns on board. "Only 10 per cent of the companies have been able to provide regulated focus and true internship training for the students," he says. "Most of them still believe that investing on training on full-time employees is more logical than investing time on management trainees or any kind of classroom training for, say, an eight-week internship programme." The internship market for online portals though appears poised to grow rapidly, The market is growing at 50 per cent with internet penetration and more colleges making it mandatory, says Letsintern's Gupta. "But we are still two to three years away from the inflection point. When more students start paying for career services, we'll monetise our product in a bigger way. Right now only a small fraction of students come to us," he sums up.